BUCUM is the second TEMPUS project that Cardiff Met has coordinated in the MENA region, and demonstrates the experience and success the institution has in enhancing Leadership, governance and capacity building in the region. The launch of the BUCUM project took place at Hassan II University – Casablanca, Morocco, one of the partners in the project. 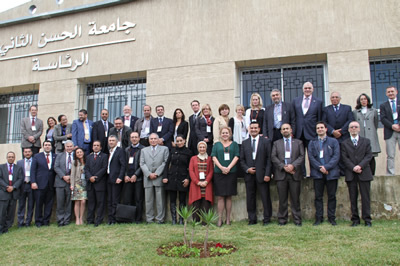 This project, which is a follow on from the Leadership in Higher Education Management TEMPUS Project, aims to mutually harmonise Higher Education systems across Morocco, Egypt, Lebanon and Libya; develop good management practices; build sustainable HE cooperation between nations and address the challenges of a global university in the 21st Century. The project launch was attended by 22 partner universities and organisations from across the EU and MENA region, including Cardiff Met’s Student Union President and Vice President. “Being selected for a second project under the TEMPUS framework shows how dedicated and well established Cardiff Met is in the MENA region. With such an excellent network of partners, we as Cardiff Met have the opportunity to develop fruitful partnerships in the region. Our latest project aims to support current and future leaders in developing competencies and skills needed to face the challenges of modern universities in 21st century.” comments Prof. Mohamed Loutfi, Pro Vice Chancellor – International, Cardiff Metropolitan University.